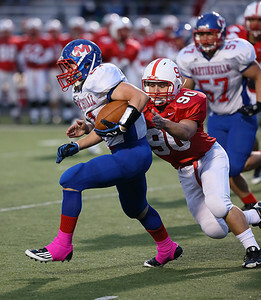 Martinsville's Kaine Liscomb (21) eludes the outstretched hands of Center Grove's Kaleb Kelsheimer (90) and goes for a long gainer on the second play of the game Friday night in round 1 of sectionals. 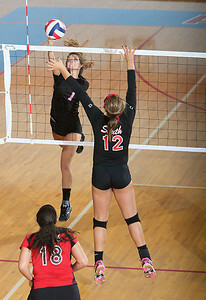 Photo by Eric Thieszen. 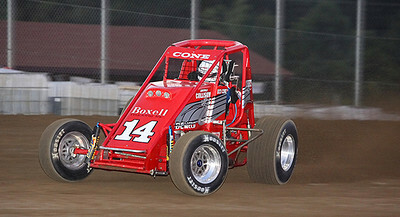 Hud Cone (14) on the back stretch at Vermilion County Speedway during qualifying for the evenings main event. Photo by Eric Thieszen. 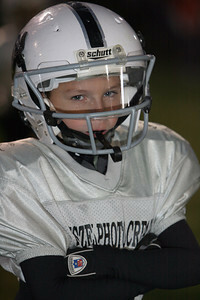 Kole Idele shows his game face before taking the field for the championship game of the Franklin Township Football League. Photo by Eric Thieszen. Garrett Johnson (24) of Monrovia heads up the sideline on his way to a 57 yard touchdown run Friday night against Linton Stockton. Photo by Eric Thieszen. 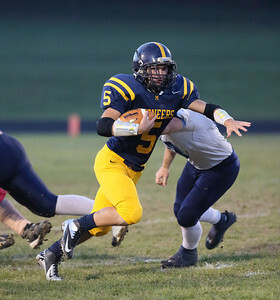 Mooresville sophomore Tommy Waites breaks some arm tackles and goes for a nice gain Friday night as the Pioneers celebrated senior night with a win over Franklin County. Photo by Eric Thieszen. 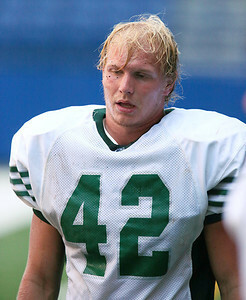 A dejected Tyler Ellis, of Monrovia, heads up the sideline towards the locker room after a season opening loss to Greencastle Saturday afternoon at Lucas Oil Stadium. Photo by Eric Thieszen. 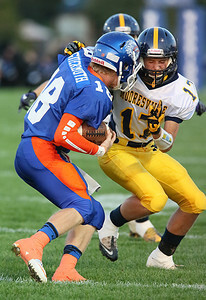 Nathan Gilbert (17) puts a hit on the Warrior quarterback Adam Gutermuth (18) to stop him for a short loss on the play Friday as Whiteland hosted the Pioneers. Photo by Eric Thieszen. Martinsville defenders Gabby Fisher (9) and Makayla Ferguson (3) try to block the slam of Bailee Williams (15) of Terre Haute South Thursday night at Martinsville. Photo by Eric Thieszen. 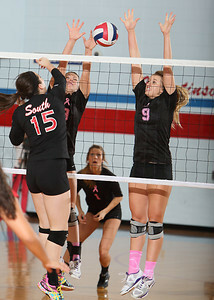 Martinsville senior, Teylor Rains taps the ball back over the net to the waiting Terre Haute South defenders as Martinsville took the match in 3 sets Thursday night. Photo by Eric Thieszen. Kurtis Faulkenburg (60) of Monrovia puts pressure on sophomore quarterback Austin Anglea of Speedway Friday night on the Sparkplugs home field. Photo by Eric Thieszen.